Thwarted again! The plan was to wrap up the scone bake-off this weekend with a final ginger scone recipe that, if I remember correctly, made a flavorful, but cake-like scone. Five zucchinis in my CSA basket pushed me in another unexpected direction. 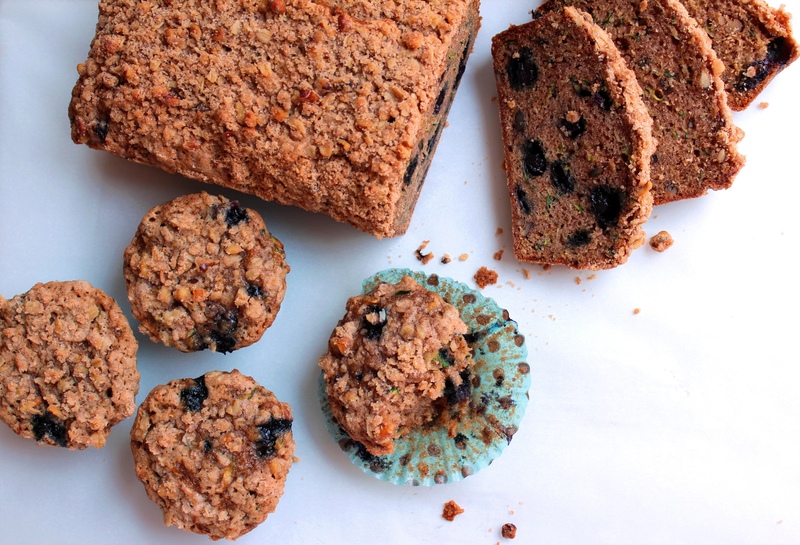 This is my “go to” zucchini bread recipe – either with or without the blueberries. Place grated zucchini in colander, sprinkle with ½ t. salt and toss. Grease and flour two 8×4 loaf pans. Preheat oven to 350 degrees. Make streusel topping by combining strudel ingredients and blending with fingers until pea-sized crumbs form. Sift 3 c. flour, ½ t. salt, baking, soda, baking powder and spices in a bowl. Using mixer, beat eggs, oil, sugar and vanilla together. Add sifted ingredients to egg mixture and gently combine until flour is fully incorporated. Dust blueberries with 1 T. flour (helps blueberries from sinking to bottom). Wring as much liquid from zucchini as possible using a dry kitchen towel. Add zucchini, blueberries and walnuts to batter and stir until combined. Pour batter into pans and sprinkle with streusel. Bake for 45-50 minutes or until toothpick comes out clean. Cool in pans on rack for 20 minutes. Remove from pans and cool completely.